Vinyl siding can be toxic when burned. Aluminum siding loses heat. But wood siding warps, rots and molds. How can an environmentally conscious homeowner choose a high-quality siding product that's green? Mastic Home Exteriors has been around since 1932, so it shouldn't surprise you that the company has used advanced technology to create superior siding products. What might surprise you is Mastic's focus on environmental sustainability--even though the company uses both vinyl and aluminum in their siding products. Ever hear of a company's vinyl siding being made from sustainable resources? Mastic's is 57 percent salt and 43 percent natural gas. The metals used in mastic products contain a minimum of 67 percent, recycled materials and are Green Circle certified. Vinyl siding takes less energy per square foot to manufacture than brick and mortar. Construction materials need to be shipped and that takes fuel. Because vinyl siding weighs less than other cladding materials, less fuel is generally used and less pollution is created. Compared to lumber, brick and cardboard, vinyl siding creates less construction site waste. Mastic provides aluminum accessories that can be completely recycled once your siding is ready to be replaced. As long as it's been installed correctly, Mastic's insulated siding has been proven to meet Energy Star efficiency standards. 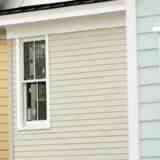 The durability of Mastic vinyl siding reduces environmental impact, because of its longevity. Even though U.S. paint products no longer contain lead, you still have to worry about the immediate, harmful effects of 10,000 other chemicals in paint. Mastic vinyl siding doesn't require paint, stain or any other finish. Mastic is working to follow the "three Rs," too: reduce, reuse, recycle. At its parent company's facilities, many post-product building materials are reused and recycled. This includes pallets and packing materials that would otherwise end up in landfills. When you're shopping for siding products, and vinyl or aluminum siding keep floating to the top of your list, keep Mastic in mind. The degree to which a product is green can't be separated from the company that manufactures it and their efforts toward environmental sustainability. Want Alcoa siding but cannot find it?